Hi, I’m Chance Reichel and I’m a trainer and consultant with Corporate Education Group. Project managers and functional managers don’t always see eye to eye, but when they’re able to work together in harmony, projects progress much more smoothly. 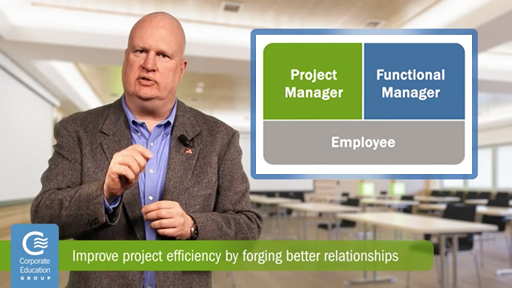 Before we review how project managers and functional managers can develop better relationships, let’s define who the “functional” manager is and in what instance they would work with a project manager. These days, many organizations are structured as a matrix. In this environment, project resources (in this case, the employees) in essence have two bosses. One boss is the project manager, while the second boss is the functional manager who is in charge of the department in which the resource works in regularly. For example, the lead engineer in a project reports to the project manager and to the lead engineering manager. This complex reporting relationship can sometimes cause chaos within a project. Since the project manager is using resources that belong to the functional manager, relationships can become strained without clear and concise communication. However, there are some simple actions that a project manager can take to make the relationship better for both parties. Project managers should first create a staffing management plan for the functional managers at the start of every project — the plan should outline the required resources, project start/finish dates and any other pertinent information that all affected functional managers will need to efficiently manage their resources. Schedule or timing issues that will need to be resolved. Overall, the best rule of thumb is to over communicate rather than under communicate. If the project manager takes a little time to connect and talk with the functional manager, the project will have a better chance of success.